This could be his finest achievement so far. 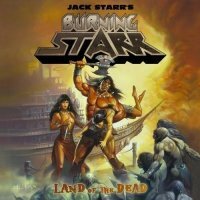 Some thirty years since he first made an impression on the US metal scene with Virgin Steele, Jack Starr has resurrected the Burning Starr moniker for new album 'Land Of The Dead'. A rallying cry for uncompromising old school power metal from start to finish the album is bursting with galloping riffs, melodic vocals and Starr's trademark shredding solos. Adding the finishing touch is some Conan the Barbarian / Manowar inspired artwork and to provide even more authenticity there are guest appearances from Manowar alumni Ross the Boss and David Shankle. Another former member of the Kings of Metal, drummer Kenny "Rhino" Earl, is a fully fledged member of Burning Starr and the band is completed by Starr's long-time collaborator Ned Meloni on bass and the vocals of Todd Hall. Hall, a veteran of 80's band Harlet, proves to be an inspired choice to front Burning Starr; possessing all of the necessary qualities to bring the lyrics to life and the ability to shift from screaming and wailing to melodic and moody in all of the right places. Starr himself is clearly still devoted to following the path of true metal and it is reassuring to discover both his playing and his songs remain creative and inventive. 'Twilight of the Gods', 'When Blood and Steel Collide' and 'On the Wings of the Night' deliver exactly what is expected; unashamedly overblown and melodramatic conjuring fantastical sword n sorcery imagery. The title track is preceded by some Hammer Horror spoken word before it launches into an energetic, heart-racing anthem and could easily be the signature song for Zombie apocalypse series 'The Walking Dead'. Closing out the eleven tracks and extending to almost seven minutes, 'Never Again' is an epic mid-tempo voyage with Hall's voice soaring above Starr's sparkling solos as the lyrics defiantly and proudly wave the flag for classic power metal into 2011 and beyond. Jack Starr and Burning Starr are most definitely burning bright and in what has been a lengthy career 'Land of the Dead' could be his finest achievement so far.